Toxicology tests revealed that traces of cocaine have been found on a hair sample taken from Francesco Schettino, the shamed captain of the capsized Costa Concordia cruise ship. Lawyers representing the survivors described the findings as “very strange” and called for Captain Francesco Schettino to be tested again. Toxicology tests revealed cocaine was lying on the hair sample and in the evidence envelope the hair was in. However, no cocaine was found in his hair or in his urine, which would indicate usage, according to the consultant who did the analyses for prosecutors. Francesco Schettino has stood by the results, but said tests are needed to see if the samples might have been contaminated. Italian consumer protection group Codacons is representing some survivors of the shipwrecked cruise liner, which rammed a reef near Giglio island the night of January 13. The expert, Marcello Chiarotti, said the modest trace of cocaine “was a marginal problem that absolutely doesn’t invalidate the results of the analysis” that found none of the drug inside the hair itself or in the urine. Traces of cocaine in the urine or inside the hair itself would have pointed to consumption. Francesco Schettino, 52, is under house arrest in his home near Naples while he is investigated for alleged manslaughter, causing a shipwreck and abandoning his ship. The Costa Concordia captain has denied abandoning ship and insisted the reef was not marked on navigational charts. 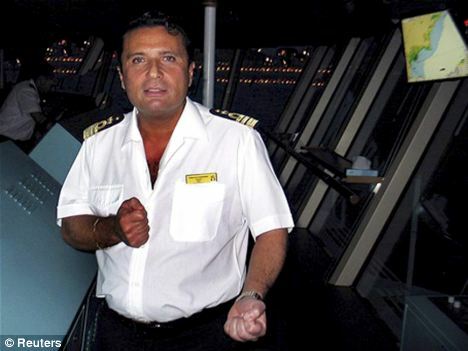 Questions have been raised about Francesco Schettino’s behavior on the bridge in the critical moments before the ship ran aground. Domnica Cemortan was seen cavorting with Captain Francesco Schettino in the minutes before his cruise liner foundered on rocks. Italian authorities believe Francesco Schettino – dubbed Captain Coward – may have been distracted from his command by trying to impress the dancer. Domnica Cemortan, who has a two-year-old daughter, had worked as a translator for the Costa Concordia but was on holiday on the ship at the time of Friday night’s disaster. A grainy photograph was taken of her on the bridge. Thirty-two people are believed to have died, including 15 whose bodies have not been found. Marcello Chiarotti was described as expressing confidence in the results. “We will be able to clear this problem up later,” he told ANSA. ANSA said that traces of the drug might have resulted if Francesco Schettino’s hair had come in contact with someone who had handled cocaine. Costa Concordia cruise ship was carrying some 4,200 passengers and crew on a week’s cruise on its standard route when it crashed into the reef during dinner a couple of hours after leaving an Italian port. Divers have been searching sections of the wreckage where some of the missing were last seen in hopes that more bodies can be recovered. After much delay, in great part because of stormy weather, pumping operations have been under way for a week to remove some 500,000 gallons of fuel from the ship’s tanks.